Logical Reasoning are one of the most important sections of various competitive exam like Bank Exam, UPSC, PSC, Vyapam, Patwari, SI, Police, TET, CTET, Samvida etc. Logical reasoning is one of the most important tools for examiner to check the mental ability and skill of exam aspirants through patterns, number sequences or the relationships between shapes, decision making, blood relations, letters in word puzzle, series, symbols etc questions. This section contain various types of Logical reasoning objective questions in Hindi language. 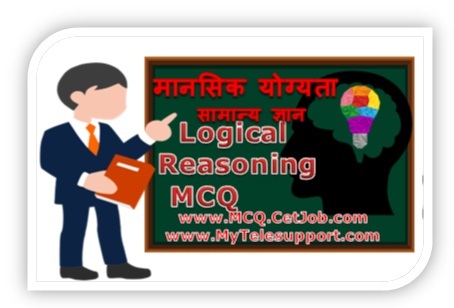 All logical reasoning MCQ are very important and frequently asked questions. मानसिक योग्यता परीक्षण में लगभग ~ १०० प्रश्न दिए जा रहे है जो की पिछली कई प्रतियोगी परीक्षाओ में आ चुके है. इन प्रश्नो को याद कर उनकी प्रैक्टिस जरूर करे.